The Stone Roses: Alan 'Reni' Wren, Gary 'Mani' Mounfield, Ian Brown and John Squire. As the '80s drew to a close, the Stone Roses made rock music cool again, melding '60s psychedelia and acid house under the production guidance of John Leckie. At the forefront of the late-'80s 'Madchester' scene that merged '60s guitar pop with dance rhythms, the Stone Roses made an indelible mark on the British rock canon. Their self-titled 1989 debut album opened the doors to a host of other UK bands, including the Inspiral Carpets and Happy Mondays. Featuring the haughtily laid-back vocal style of Jaggeresque frontman Ian Brown, catchy hooks of guitarist John Squire, and infectious rhythms of bassist Mani and drummer Reni, The Stone Roses sandwiched anthems such as 'She Bangs The Drums' and 'Made Of Stone' between trance-like opener 'I Wanna Be Adored' and epic closer 'I Am The Resurrection'. 'She Bangs The Drums' became the Manchester band's first top 40 single, yet it was the funky 'Fools Gold', recorded after the album's UK release and subsequently added to American pressings, that finally cracked the top 10, reaching number eight that November. 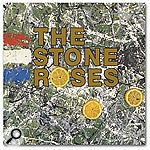 During a halcyon year, and preceding ruinous legal wranglings with Silvertone Records, this single would prove to be the Stone Roses' crowning achievement, and it was also among the career highs of producer/engineer John Leckie, who in the next decade would be responsible for such classics as the Verve's A Storm In Heaven, Radiohead's The Bends and Kula Shaker's K.
Originally a tape-op at EMI's Abbey Road Studios, Leckie had assisted on early-'70s projects such as John Lennon's Plastic Ono Band, George Harrison's All Things Must Pass and Pink Floyd's Dark Side Of The Moon, before making his production debut with Be-Bop Deluxe's Sunburst Finish album in 1976. After going freelance a couple of years later, he'd then worked with the likes of XTC, Public Image Limited, Simple Minds and the Fall, and it was on the strength of this resumé that, towards the end of 1988, he became involved with the Stone Roses. Leckie at Mushroom Studios, Vancouver, 1990. "I initially received a demo tape from Geoff Travis at Rough Trade," Leckie recalls, "and by the time I got back to him they'd signed with Silvertone. I then got the same kind of tape from Silvertone, so it was clear that the band had asked for me to work with them... I can't now remember what songs were on the tape, but I know they included 'Waterfall', 'She Bangs The Drums', 'This Is The One' and 'I Am The Resurrection'. "Basically, I was brought in to do my thing. The A&R guy, Roddy McKenna, was quite a tough Glaswegian, and he told me 'You're gonna make this good.' He didn't specify what this meant, but he'd come down to the studio and tell us when he thought something was good or something was bad." 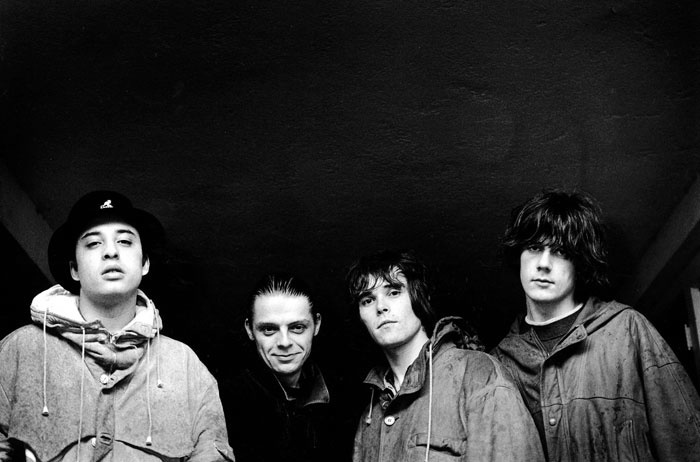 After mixing the Roses' third single, 'Elephant Stone', Leckie spent a few days rehearsing with them in Manchester before the album sessions commenced at North London's Battery Studios, where four tracks were recorded within the space of 10 days: 'I Wanna Be Adored', 'She Bangs The Drums', 'Waterfall' and 'This Is The One'. 'Waterfall' would subsequently be re-recorded at Rockfield in Wales. 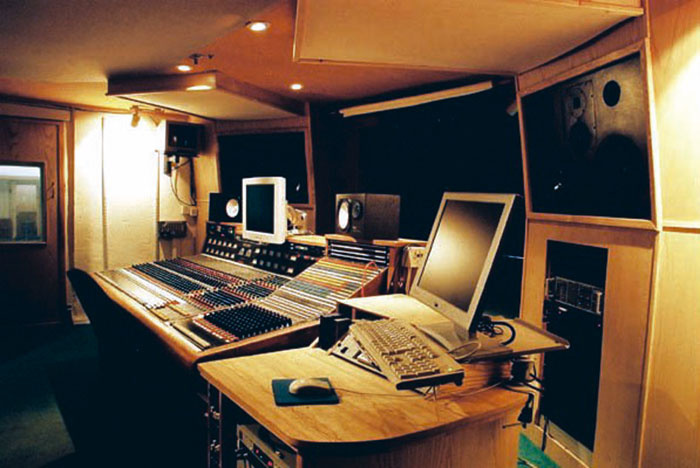 Utilising an SSL E-series console and Studer tape machines, the Battery sessions took place between about seven at night and nine in the morning, and the day after they ended, the Studio Two complex was dismantled and converted into offices. Thereafter, the relocation to Rockfield saw the aforementioned remake of 'Waterfall', as well as tracking sessions for '(Song For My) Sugar Spun Sister', 'Made Of Stone', 'Shoot You Down' and 'I Am The Resurrection'. There, Leckie pushed the faders on a Neve, alongside Battery in-house engineer Paul Schroeder, who until then had never worked anywhere else. "He had only worked an SSL, and he'd also only really worked with drum machines rather than a live kit," Leckie says. "So, he got quite an experience, although I did a lot of the engineering as well." In the meantime, there was also the producer's relationship with the band members, which he now describes as "Very much a collaborative thing. On any given day the guys would come in with songs that Ian and John had demoed on the Fostex, consisting of just guitars and vocals. John always used a capo on his guitar and he'd spend ages tuning, and there was also a lot of bass tuning as well as time spent on the vocals, although Ian sang a lot better in those days. Regardless of some people's negative comments about his singing, to me he was no different to any other vocalist. He'd perform, say, four takes, and I'd comp them and bounce them down. It certainly wasn't a nightmare. He'd always get what we wanted within a couple of hours, and back then you have to remember there was no Auto-Tune." Ian Brown would actually record guide vocals while guitar, bass and drums were captured live, providing each song's foundation before small sections were dropped in and other parts overdubbed. "They were all competent musicians," says Leckie. "I think the standards these days have gone downhill, but the Stone Roses were a gigging band who had been in the studio before, and the main thing was their optimism and the vibe: 'Yeah, we're gonna make it. Yeah, we're gonna have a great time doing it.' It was all about having fun making music, even if they were also very fussy. We had a good time doing that album, and I think it shows in the music." Including further recording sessions at Konk and mixing at Battery Studio One and Abbey Road's Studio Two, the album took a total of 55 work days to complete, spanning October 1988 to March 1989. 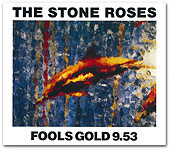 Thereafter, with the Stone Roses playing to sold-out venues across the UK, the band members went back into the studio just under six months later, on August 23, to commence work on 'Fools Gold'. "The record company was looking for another single, but Ian and John were also getting prolific," Leckie explains. "The main thing was, they had a killer track." 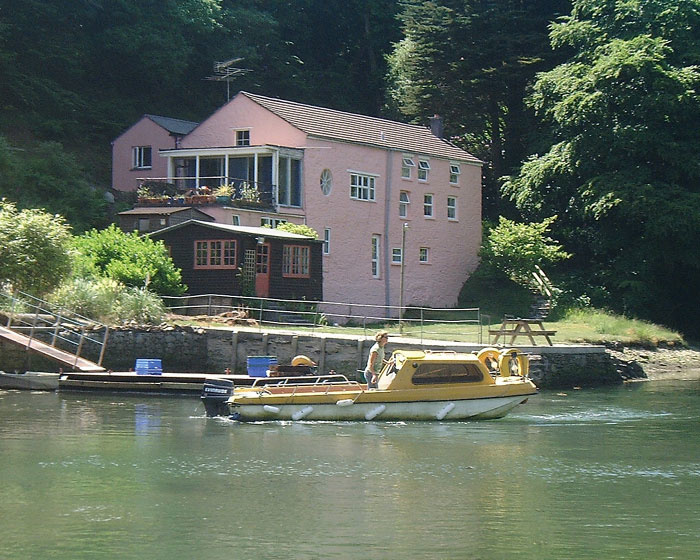 Situated on a tidal river in remote Cornwall, Sawmills Studio is accessible only by boat for much of the time. 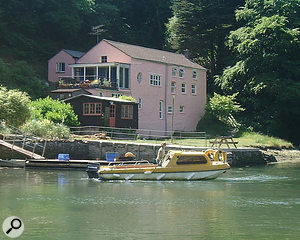 As it happens, the studio that band and producer entered was quite unique: the Sawmills in Cornwall, one of the UK's first residential facilities and also among the most remote, located within a creek on the banks of the River Fowey. The only means of access is by boat or, when the tide is out, by walking along a railway line. "If they tell you to be there at four o'clock to get the gear in and you turn up at five and the tide's gone, you have to wait 12 hours before your next chance," Leckie remarks. "Everything fits on the little boat and off you go. Then, once you're there, you can't get out unless the tide's in or you want to take a half-hour walk through the woods. It's a fantastic place." The main building, a 17th-century water mill with low ceilings and plenty of natural daylight, contains a live room, a couple of iso booths and 'the cave', a small bare rock area at the back of the studio, in addition to a control room and machine room. In 1989, as is the case today, the control room housed an 82-channel Trident Series 80B console and 24-track Otari MTR90 MkII recorder. "I've worked on a lot of projects there," states Leckie, "including a psychedelic album named Chips From The Chocolate Fireball that I produced in 1987 for the Dukes of Stratosphear. This was XTC under a different persona, and the Roses told me that record was the main reason for them asking to work with me. "The Sawmills' in-house engineer, John Cornfield, largely built the studio, and he was involved in the 'Fools Gold' sessions during the 18 days that we were there. Then we went back to Battery Studio One for four days, where Ian did his vocals and John [Squire] played all of the little wah-wah guitar licks that he'd worked out to go between the main lines. Paul Schroeder and I did the mix at Battery, but it didn't work out — spending three days on overdubs and then the last to do the mix very rarely works. There's a lack of objectivity and distance, because you always tend to focus on the last things you record. Time off helps. And what's more, as Alan Parsons has said, the time it takes to mix is directly proportional to the number of people in the room. So, on October 3 and 4, I went into RAK Studio Three on my own and mixed 'Fools Gold' along with the 'B' side, 'What The World Is Waiting For'. Again, I was working on an SSL, and I took a couple of days to mix both songs." It's interesting to note that, up to this point, the band members actually intended 'What The World Is Waiting For' to be the 'A' side, with 'Fools Gold' in the secondary role. "I thought 'Fools Gold' was fantastic and so to me it was obvious it should be the 'A' side," Leckie says. "But all along the band had different ideas, and in fact early copies of the 12-inch record did have 'What The World Is Waiting For' as the 'A' side. That got changed around pretty quick, yet it meant that throughout production we gave a lot of attention to the 'other' track." The control room at Sawmills. "John Squire always had his Fostex 16-track recorder in the tape cupboard at the back of the studio, and after we'd gone home he would sit there with headphones and work out all his parts," says John Leckie. "He always did that, right through 'Fool's Gold', up until the second album. In fact, part of the reason for the breakdown of that second album was that John would sit in his bedroom with the Fostex while the rest of us waited in the studio for his guitar parts. He wouldn't improvise or make something up in the studio, but he got to the stage where he was really good. For instance, on 'Bye Bye Badman' there's a guitar that plays all the way through — a kind of counter-lead line, going through a Leslie — and I remember him playing that in about half an hour. However, we had to wait four days for that before he came out of the cupboard." The Fostex was also responsible for the Stone Roses album track 'Don't Stop', which evolved from the 16-track demo of 'Waterfall' being played backwards. Piecemeal in nature, the recording approach for 'Fools Gold' was totally different to that employed for the album. John Leckie didn't hear either this track or 'What The World Is Waiting For' until he met up with Ian Brown and John Squire in Cornwall. Then, what he was presented with in terms of the former song was a demo consisting of a four-bar drum loop and tambourine along with a guitar, vocal and some reverb. "The drum loop came from a record," Leckie says, "and the funny thing about it was, when the track ran out on that record, you could hear them lift the needle and put it on again. They'd brought the record with them, so we copied the drum track and made the loop in an [Akai] S1000, sequenced on Cubase. We spent ages tuning that loop, trying to get the right tempo and generally fiddling about, and we quite enjoyed doing that. After that, the challenge was where to put the band on top, how to represent their individual characters. With any band, I like to give each of the musicians equal importance. "The song didn't really have any structure at this point — it was kind of verse, chorus, jam — and so what we did was lay down about five minutes of the loop onto tape before adding the guitar and bass, trying to determine what to put on without destroying the vibe. Tuning the loop had set up the vibe, and whatever we put on it would kind of change it, so different ideas came up, like a second bass line that floats over the top of the main bass line. Then there was the idea of sticking on the one note, 'E', and then coming back to the loop again. This gave us loads of possibilities, which nowadays would be easy using Pro Tools, but back then we had to imagine something, cut the tape, and if we got it wrong, cut it back again." For Leckie, the more laborious method is also the most enjoyable one. "I've done records on Pro Tools, but I just prefer the whole attitude and discipline with regard to tape. Getting your head around things can be a lot of fun, whereas when you're given the freedom of using Pro Tools it can get painful because you spend all your time exploring that freedom without ever really reaching a conclusion." While Mani's spray-painted Rickenbacker bass was DI'd and fed through an Ampeg SVT amp miked with an AKG D12, he did also try playing an Ashbory bass with its short-scale silicone rubber strings. This, however, never survived the final cut. "Of course, the big problem with us wanting to retain the original vibe of the loop was what the drums were going to do," Leckie comments. "Reni would play along, aware that we didn't want to replace the loop, even though on the final record it's mixed out in several places to reveal Reni's playing and provide more intensity. He actually played great across the loop, using his own custom kit made up of bits and pieces: floor toms painted by John Squire, a Gretsch bass drum and a Ludwig snare, although on 'Fools Gold' we experimented with a smaller Noble & Cooley snare. This was miked with a [Shure] SM57, while there was a D12 on the bass drum along with a Sennheiser 421 to provide a bit more slap and clarity. The D12 was to give it more weight, and we had to position both at the same distance to avoid phase problems. The toms were miked with [Neumann] U87s and 421s, while the hi-hat had an AKG 451, padded down. As the Sawmills live area is quite small with a low ceiling, solid stone walls and lino on the floor, the drums always sound very tight in there. Reni also played bongos, and I think he attempted congas, too, but a lot of 'Fools Gold' has a bongos rhythm." Whereas the drums were positioned in the centre of the live area, Mani's bass amp was closed off in the aforementioned 'cave'. John Squire, meanwhile, played his pink Fender Stratocaster and custom-painted Hofner 335 copy in a far corner, opposite that occupied by the studio's grand piano, with two screens supporting a horizontal one that served as a kind of roof, while a third served as a makeshift door. Inside this setup, Squire used a Fender Twin reverb with JBL speakers, rented from Dreamhire, and played lead parts on the Hofner and rhythm on the Strat, captured with either a Shure SM57 or SM58 together with a Neumann U67. "Things weren't recorded in a big, open space," Leckie confirms. "They were recorded in closed spaces. But then, the main room itself isn't that big anyway, and the control room is right next to it, separated by a three-foot-thick stone wall, providing perfect separation." It was in the control room that Ian Brown recorded his vocals, an SM58 having been set up between the main monitors that were only about 15 feet apart. Leckie wasn't concerned about a little spill, and he also had little to worry about in terms of Brown's performance. "It was a pretty simple vocal," he asserts. "The phrasing never changed between the guide track and the final version, and we always had the same reverb on his voice; a Lexicon PCM60, whose reverb is very rich and clear, and which was also used on the main guitar riff." 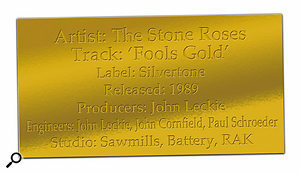 According to Leckie, 'Fools Gold' evolved as the sessions progressed, especially the song's second half. It was, after all, released in two versions: one clocking in at nine minutes, 53 seconds; the other, an edited down radio mix, lasting a mere four minutes, 15 seconds. "The playout on the nine-minute, 53-second version kept getting longer and longer," he says. "John would have different ideas for the various parts, saying 'Oh, I need to extend this by three bars,' and we were on the leader tape, picking up on code and everything. That meant we had to edit, copy and jam-sync the code, and then fly in everything that had gone before — like the drum loop and bass — sample it onto the Akai S1000, sync it up with Cubase and fly it back in. The object was to eventually get everything onto tape, so when it came to the mix anyone could replicate what we'd been doing. "A lot of effort was put into getting the right sound. They wouldn't play anything unless it sounded good. It wasn't a case of 'OK, turn the mics on and keep going.' We'd spend three days working on the drum sound, and then Reni would be too tired to play so we'd say 'Well, let's do the bass.' Mani would spend two days working on the bass sound, and he'd go back and change it. And then John would take delivery of endless guitars and amps, plug them in and try different mics, but it was always the same parts being played and I would share in the learning process. It wasn't a case of wild experimentation, but just getting the best possible sound and something that we all got off on. In fact, whenever there was experimentation, we'd end up going back to the original sound. "Over the 18 days it was a creative process. The second half of the song was all worked out in the studio, and then there were these crazy noises that I highlighted in the mix. We'd messed around with things like slowed-down cymbals, and at the time none of those experiments had worked, but then when I got to the mix I had all these weird tracks to play around with and you get glimpses of them in the second half of the song. Once I got on a roll, there was a temptation to somehow incorporate all of the experimental stuff, but in the end I just retained the most important elements. "Having recorded the album very much as a band, doing the 'Fools Gold' parts one at a time was quite different for us. However, because of the groove of the track and the atmosphere working at the Sawmills, everyone enjoyed it. We all picked up on the spirit of the place. The Stone Roses were, you see, a very vibey band. And it also helped that, on the first day we arrived there, the record company phoned to say that they had an advance order of 30,000, meaning that, no matter what we did, the single was going to chart. It was a good position to be in, and while some bands could have felt under pressure to deliver the goods in that kind of situation, the Stone Roses thrived on it." And they did indeed deliver. 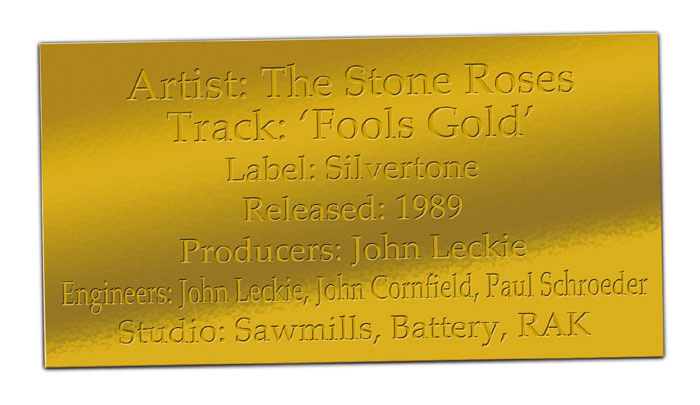 Still, the fact that 'Fools Gold' was so different to the preceding album made it stick out like a sore thumb when it was tacked onto the end of the American release. 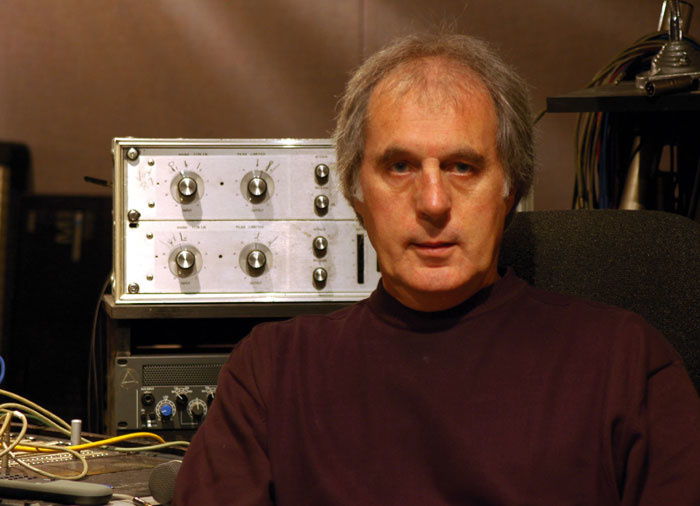 "It was totally out of context," insists John Leckie, who has recently been working with another Manchester outfit, New Order, as well as an American band called Longwave. "In fact, the scary thing was coming up with a single that was nothing like the album, but it enjoyed a lot of success as an 'indie dance crossover', so we obviously got it right!"